Kalimpong, Aug. 5: Gorkha Janmukti Morcha president Bimal Gurung today asked hill rivals ABGL and CPRM to jointly fight with his party for Gorkhaland and warned that “anything can happen” once Morcha supporters take to the streets. This is the first time that Gurung has said the Morcha and its rivals in the hills should jointly agitate for the formation of a separate state. The ABGL and the CPRM were both against the formation of the GTA and had repeatedly said that the Morcha had diluted the statehood cause by accepting the hill set-up. Gurung told supporters to hit the streets without the fear of the CRPF or the police. The Morcha chief also said the death of Rajput in support of statehood last week would not go in vain. He said it was impossible to achieve Gorkhaland merely by singing and clapping hands and the people must be willing to sacrifice their lives to achieve the goal as Rajput did. “Both the central and state governments must take this (Rajput’s death) seriously. We are all willing to die for Gorkhaland, even the minorities (read non-Gorkhas),” he said. Rajput, who was in his mid-forties, was not a Gorkha but had been associated with the statehood movement from the time the GNLF was the reigning force in the hills. Rajput had actively participated in the agitation for Gorkhaland under the banner of the GNLF in the 1980s and the Morcha in the recent past. 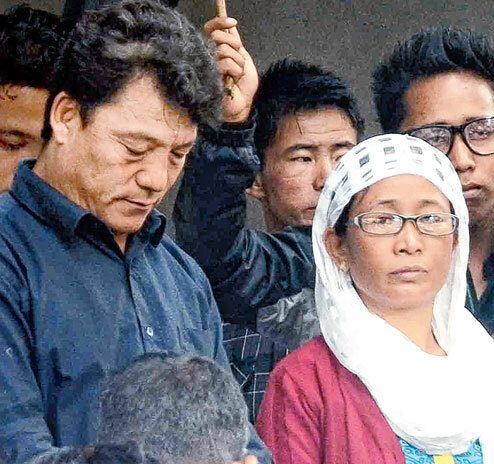 “We are confident that his sacrifice will not go in vain,” said Anos Das Pradhan, the national president of the Bharatiya Gorkha Parisang, an apolitical organisation. Rajput and Manju, a Gorkha, were married in 1989. They have two sons, Arpan, 22, and Aman, 20. Before Gurung spoke, people gathered at Damber Chowk in thousands to pay their respects to Rajput. His body was brought to Damber Chowk from his home at Dr. Graham’s Homes around 11am. People offered wreaths, khadas (scarves) and incense sticks to the body of Rajput. From Damber Chowk, the body was taken to the Corner Stone Church, where a prayer was held. Rajput was buried in the nearby cemetery amidst cries of “Mangal Singh Rajput amar rahos (Long live Mangal Singh Rajput)”.